Before one can fully appreciate the significance of Survey J-3, it is important to understand the people who created the survey and those who carried it out. 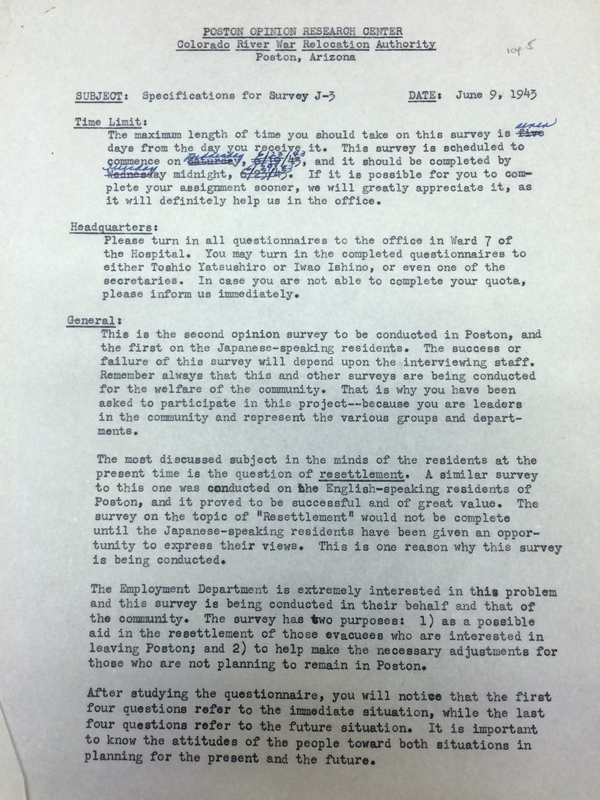 Commissioned by the War Relocation Authority (WRA), Survey J-3 was an attempt to collect the opinions of the Japanese-speaking internees on the issue of resettlement. The creators of the Japanese-language survey had a particular interest in the Issei generation, so it makes sense that the vast majority of Japanese-speaking internees were Issei. The administration placed a great deal of value in the opinions of the Issei, seeing them as the more influential generational group. They believed that their efforts “would not be complete until the Japanese-speaking residents [had] been given the opportunity to express their views”. In addition to the survey, the interviewers were given specific instructions for the manner in which they were to ask the questions. Further, they were presented with the WRA’s rationale for asking each particular question. Initially, it seems as though the WRA and Poston administration’s intentions are benign. 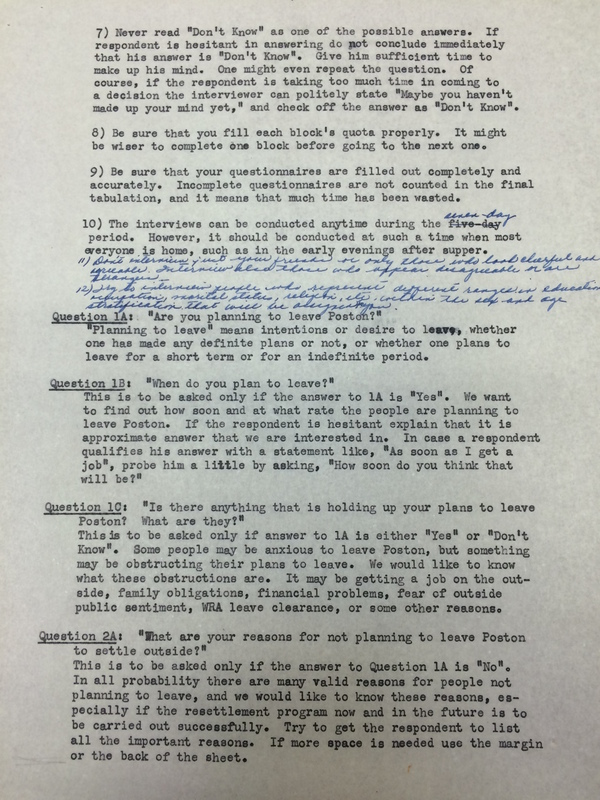 Throughout the Specifications for Survey J-3, the WRA stresses that the purpose is to benefit the “welfare of the community” as an “aid in the resettlement of [the] evacuees who [were] interested in leaving Poston”. However, the interviewers and WRA were unable to see the implications of superiority, misunderstanding, and racism that they and the survey put forth. While the WRA claimed that their intentions were for the welfare of the interned Issei, their rationale exposes that they viewed the Issei as cheap labor, did not consider other factors when it came to language, and oversimplified the issue of resettlement. When creating the surveys, many believed their efforts to be benevolent in nature. 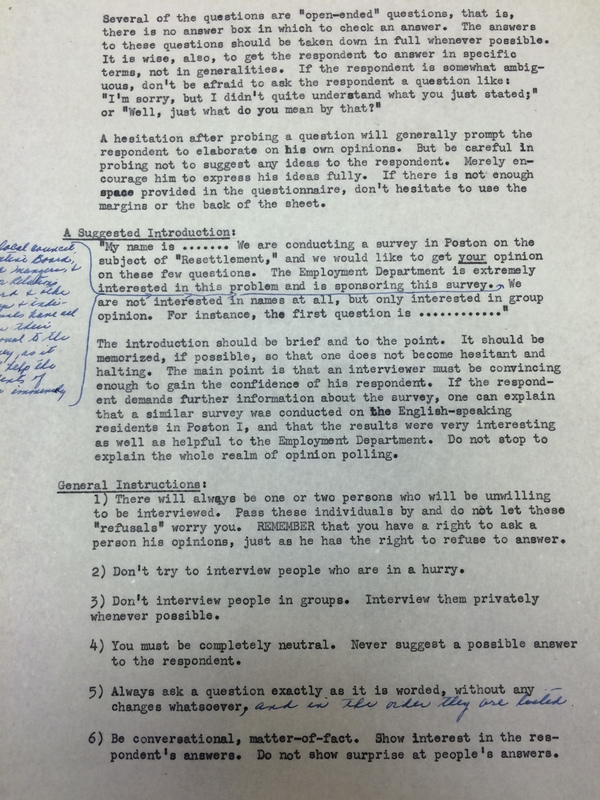 They saw the surveys as a vital tool for understanding the opinions of the internees. The problem is that the surveys and the camps made the Caucasians superior and were patronizing towards the Japanese immigrants. 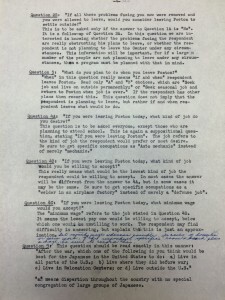 The WRA, working with the Labor Department, drafted the questions in a manner that limits the assumed potential of the internees. Instead of finding out what role the Japanese-Americans saw themselves playing in the future, the WRA treated the situation like a storage and cost issue. 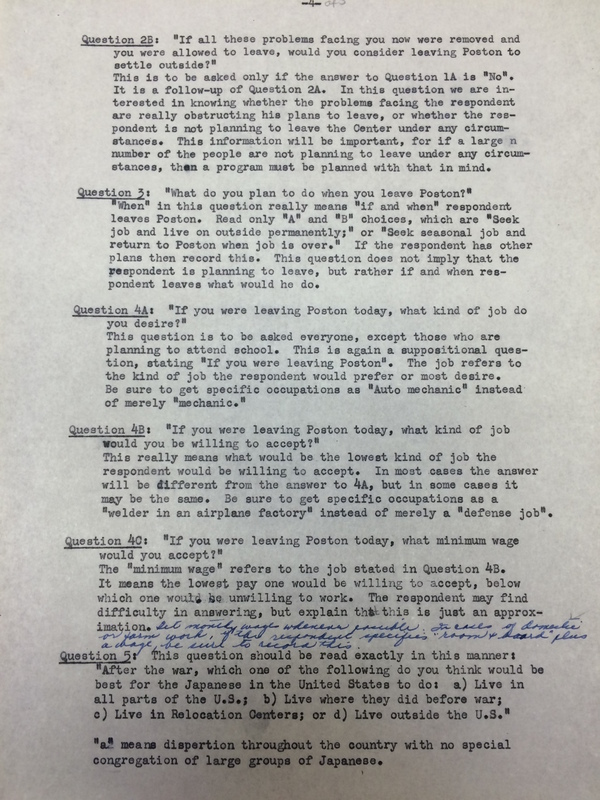 In question 4C, the survey sought to ascertain what “minimum wage would [the internees] accept”. Instead of seeing the internees’ boundless potential as successful citizens (many already were), the WRA sought out the lowest value of each individual. The phrasing of the question alone demonstrates that the WRA only saw value in Japanese Americans as a form of cheap labor. Despite the passing of decades, the US Government’s view of Japanese Americans had not evolved from the early days of Japanese immigration. The very idea that the surveys were for the benefit of the internees feels like a continuation US efforts to assimilate and democratize Asian Americans. The WRA and US Government moved people against their will and placed them in camps, then acted as though they valued the opinions of those people. Yet in truth, it seems as though the WRA was not seeking the opinions of Issei, so much as trying to find out where to put these people and how much it will cost to pay them. This question is exceedingly important when one considers that the Issei’s main avenue for leaving the camps was through employment. The WRA further demonstrated its view of the Japanese as cheap labor in question 4B of the survey. 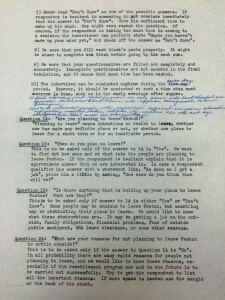 The question asks the internees what type of job they would be willing to accept. However, it is the rationale for this question that bolsters the claim that the WRA saw Japanese Americans as cheap labor. The explanation clarifies that the goal of the question is to ascertain “the lowest kind of job the respondent would be willing to accept”. It is hard to ignore the hypocrisy. The administration erected the façade benevolence, while simultaneously determining the lowest value they could assign to each group of Japanese immigrants. The problem was that the “attempt of ethnographers to realize their positive intentions inadvertently incorporated notions of self control with repressive implications”. These implications “worked implicitly to justify relocation, restated stereotypes, and left unexamined ‘the essentially racist assumptions behind internment’”. The surveys were riddled with misunderstanding about the Japanese internees, rooted in racist generalizations. Despite the claims that the intentions of the WRA were to benefit the futures of the internees, it appears that their motivations were far from selfless. After years of attempting to assimilate Asian Americans, sociologists had a change in thinking. They realized that the race relations cycle, “culminating in assimilation of the minority group into the majority…occurred over ‘generations’”. It then became increasingly important to observe the differences in the Nisei and Issei generations, and their opinions of each other and their shared heritage. Question 7 of Survey J-3 asked if the interviewee “[felt] Niseis should study the Japanese language more than before evacuation, or less”. Keep in mind that this survey is intended to collect the opinions of the Issei, who generally did not speak very much English. The rationale for this question explains that the WRA sought to evaluate the value placed on knowledge of the Japanese language. In this, however, the WRA failed to understand the other factors about valuing language. The Nisei had emerged as leaders of their community and in order to defend the interests of the Issei, they would need to be able to speak Japanese. Knowledge of Japanese was not a question of continuing their heritage, but an imperative for the future well being of the Issei generation. 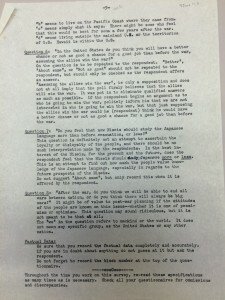 In this form of the question, the WRA treated the Japanese language as a barrier to assimilation. Further, it is important to note that the rationale for this question explains that it “is definitely not an attempt to ascertain the loyalty or disloyalty of the people”. Despite this claim, it is clear that this was not the case. Both leaders of the WRA, Milton Eisenhower and Dillon S. Myer, “favored the release of ‘loyal’ Japanese Americans as quickly as possible”. At the root of the issue, one group is assuming that their way of life is superior and worthy of conforming to. Those who actively worked towards assimilation were viewed as more loyal and deemed more suitable for quick resettlement. However, if loyalty was associated with the value placed on the Japanese language, the Nisei would have a significant advantage over the Issei. What the WRA did not understand that the generational dynamic had changed when Japanese Americans were interned. There had been a major power shift in the camps from the Issei to the Nisei as Issei men were no longer the breadwinners in their families. The Nisei therefore took on a role of defending and representing the interests of the Issei going into the future. The WRA’s lack of consideration for the additional factors influencing opinions of the Japanese language demonstrates a fundamental misunderstanding of the shifting generational roles and the implications the survey made about loyalty to the US. Despite the position of Survey J-3 being to gather Issei opinions on resettlement, the WRA failed to appreciate the complexity of the issue. At the root of resettlement was the fear of having Japanese immigrants on the West Coast. The US Government was deeply concerned about their inability to protect infrastructure against sabotage by Japanese Americans. In a special report commissioned by the State Department, Curtis B. Munson brought attention to this vulnerability. Munson suggested that “the harbor of San Pedro [Los Angeles’s port] could be razed completely by four men with hand grenades,” and that, “dams could be blown and half of [Southern] California could die of thirst”. As any invasion by the Japanese Empire would take place on the West Coast, it became a priority to move Japanese Americans away from the coast. The US Government believed the solution to this issue was to “‘collect all alien subjects…and remove them’ to the interior of the United States”. So from the very beginning, it was the goal of the WRA to relocate Japanese immigrants away from the West Coast. 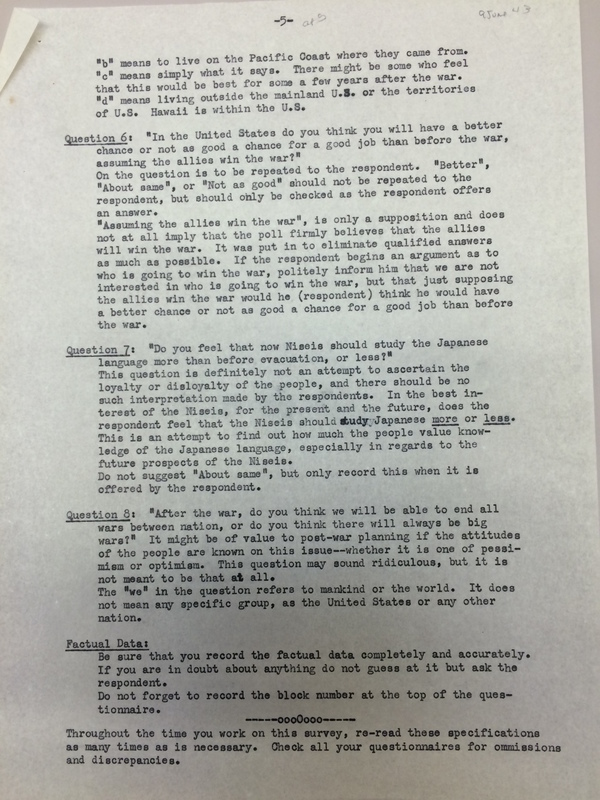 Yet, question 5 of Survey J-3 asked the internees where they thought the Japanese should move following the war. In particular, the question asked if the interviewee believed the Japanese should “a) live in all parts of the US; b) live where they did before the war; c) live in relocation centers; or d) live outside the US”. The question is presented as if the Japanese had the freedom to make the final decision on this matter. Further, asking the Issei where they would like to move failed to recognize the additional considerations involved in relocating one’s entire life. The WRA was delusional in their belief that relocation simply a decision on where one would like to live. They failed to acknowledge that the internees had family, friends, businesses, and communities that they held dear. A particular area of misunderstanding was the WRA’s lack of appreciation for the value placed on Japanese communities. 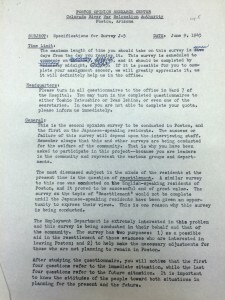 In the rationale for question 5a), the survey clarifies that the decision to live in all parts of the US meant living throughout the nation “with no special congregation of large groups of Japanese”. Essentially, if the interviewees stated that they wanted to relocate throughout the US (as the WRA wanted them to) they would be agreeing to live away from large groups of fellow immigrants. The rationale offered in the survey continues to support the efforts of assimilation, by breaking up primarily Japanese communities. In doing so, Japanese immigrants would have a difficult time celebrating their culture and maintaining their traditions and heritage. The WRA’s oversimplification of the resettlement process significantly overlooked the considerations that factored into the Japanese immigrants’ relocation preferences. The WRA’s inability or unwillingness to see this contradiction undermines the validity of the survey results from the start. Yet, that does not mean that they are completely without value. 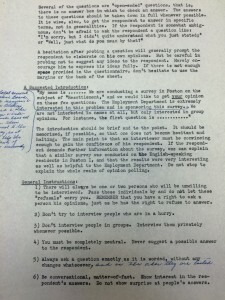 When taken in context, the surveys provide a unique perspective of dichotomy between the intentions of the interviewers and the implications of their actions. The attempts to better the welfare of the communities worked only to create more resentment and discontent within the camps. Without explicit racist comments, WRA still managed to create a survey riddled with ignorant misunderstandings of the people they were interning. As a consequence of their feelings of superiority, the WRA failed to understand the evolving relationship between the generations that drove public sentiment. The Nisei were the new leaders of the Japanese American community and would continue to be long after they left the camps. The shortsighted stance of those running the camps caused potentially avoidable tension between themselves and the internees. “Specifications for Survey J-3,” Japanese-American Relocation Centers Records. Division of Rare and Manuscript Collections, Cornell University Library, 1. Orin Starn, Engineering Internment: Anthropologists and the War Relocation Authority (Hoboken: Wiley, 1986), 703. Brian Hayashi, Democratizing the Enemy (Princeton: Princeton University Press, c2004), 20-21. Specifications for Survey J-3, 5. Roger Daniels, Prisoners Without Trial: Japanese Americans in World War II (New York: Hill and Wang, 1993), 77. Chrissy Lau, “Japanese American Incarceration” (speech, Ithaca, NY, October 21, 2014). Specifications for Survey J-3, 4.